Like La Galopade, this Pas de Trois is a simple sequence dance created by French dancing master and author Eugène Giraudet. Giraudet was a composer as well; he credits himself for both the dance and the music and on the sheet music calls himself "Auteur, compositeur, et professeur de danse." The Pas de Trois is particularly useful, as Giraudet notes, when there is an imbalance of ladies and gentlemen at a ball, since it is danced by sets of three. Giraudet is not the only one to have thought of this; there are other Pas de Trois choreographies in late nineteenth-century French sources (including Giraudet's own books). But this is the one Giraudet claims as his own. 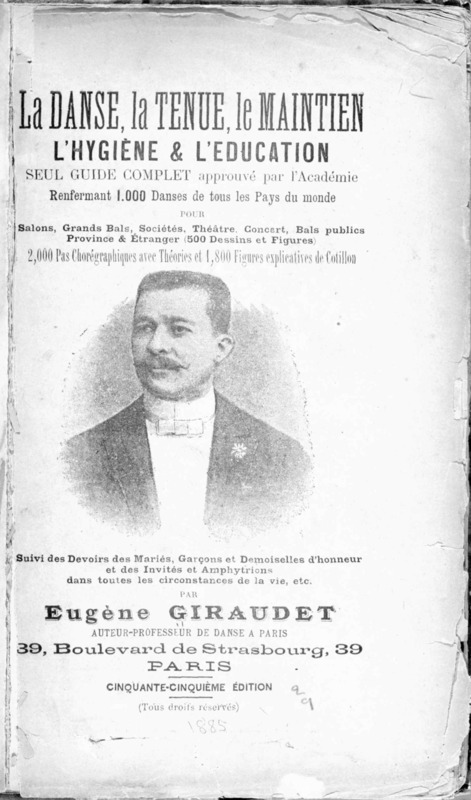 Instructions for Giraudet's Pas de Trois appear with the original sheet music as well as in the 55th edition of Giraudet's dance manual, La danse, la tenue, le maintien, l'hygiène & l'éducation (c1900), and his 1913 Méthode moderne pour bien apprendre la danse. A somewhat different version appears in B. G. Bottallo's Guide du bon danseur (Paris, 1912). The dance can be dated quite precisely, since the sheet music is specific: September 20, 1894. Interestingly, in La danse, Giraudet credits the music to "Hamel", which caused me a long delay in writing up this dance while I argued with the Bibliothèque nationale de France over whether the composer had been dead long enough for copyright to expire and for them to provide me with a copy of the sheet music. La Galopade is a short, simple sequence dance created by French dancing master, choreographer, and author Eugène Giraudet and preserved in the enormous 55th edition of his dance manual, La danse, la tenue, le maintien, l'hygiène & l'éducation (c1900) as well as in his 1913 Méthode moderne pour bien apprendre la danse. A matching description appears in George Washington Lopp's La Danse (Paris, 1903). In the companion volume to La danse, Traité de la danse (c1900), Giraudet dates the dance to 1889; its earliest appearance may have been on the accompanying sheet music by composer Félix Chaudoir. The dance itself is consistent across the sources and entirely straightforward to reconstruct. The dancers start side by side, as shown above (click to enlarge), inside hands held high, gentleman's left hand on his hip (palm out) and lady's right hand holding her gown. They start on "outside" feet (his left, her right). Couple follows couple around the room in a line or circle. Because it moves against line of dance, La Galopade is best done by the room as a whole, rather than as a variation in a normal galop or polka. Open to original position holding inside hands and restart from the beginning. At least two dances called Polka Croisée appear in French manuals. One is a rather banal sequence dance that appears to have a German origin (as the Kreuz-Polka) and one is a completely separate dance by American expatriate George Washington Lopp, who spent time as a dancing master in Paris around the turn of the twentieth century. Lopp's major survey of couple dancing, La Danse (Paris, 1903) is largely a translation of M. B. Gilbert's Round Dancing (Portland, Maine, 1890), which is one of two major sources for the Cross Step Polka (as previously discussed here). But Lopp's Polka Croisée, while clearly inspired by the version that appeared in Gilbert's book, is distinctive enough to be considered a separate dance. The major points of difference are that while the Cross Step Polka that appeared in Gilbert, as well as in the fifth edition of William B. DeGarmo's The Dance of Society (New York, 1892), is a four-bar sequence with the lady and gentleman actually doing completely different steps in the first and third measures, with a standard glide sequence and half-turn in the second and fourth, Lopp's version is a longer, eight-bar, sequence which has the dancers matching footwork and turning only on the fourth and eighth measures. It maintains its connection to the Glide Polka (a.k.a. Coquette), but the partners perform it in unison. Professor Sheldon's Presidential Polka Quadrille was created by Washington, D. C., dancing master George T. Sheldon, who had a lengthy career as a dancing master to both children and adults and was the author of at least a couple of other quadrilles. In May, 1898, Sheldon was discussed briefly in M. B. Gilbert's dance journal, The Director, in which it was said that he was then 72 and had been teaching for 57 years. His most famous pupil was probably Nellie Grant, daughter of President Ulysses S. Grant. This quadrille was said in several sources to be dedicated to her. Professor Sheldon's Presidential Polka Quadrille seems to have first been published around 1893, possibly by H. N. Grant, and thereafter turns up in a number of midwestern dance manuals running through the early years of the new century. It is referred to variously by its full name, by the shorter Sheldon's Presidential Polka Quadrille or Sheldon's Polka Quadrille, and, in one manual, as Williams' Presidential Polka Quadrille. I have no idea who Williams was or why he was credited with a quadrille well documented as having been authored by Sheldon. Like most polka quadrilles, Professor Sheldon's Presidential Polka Quadrille is primarily an excuse to polka, with just a few stray figures thrown in between polka segments. I was drawn to it by the interesting mixer element in Figure 3 and the unusual way of performing the right and left (chaîne anglaise) around the edge of the set in each successive iteration of Figure 4. In general, this is a straightforward reconstruction with only two real problems to resolve, which are discussed in the notes below. Here's an intriguing little polka variation from late nineteenth century America: the cross step polka, which is found in both M. B. Gilbert's Round Dancing (Portland, Maine, 1890) and William B. DeGarmo's The Dance of Society, Fifth Edition, Revised and Enlarged (New York, 1892). It's quite easy to do and is particularly interesting because the partners dance different steps at the same time while in a close ballroom hold, which is quite unusual in late-nineteenth century couple dancing. Some earlier examples of this kind of mismatched footwork include the slow French waltz and sauteuse described by Thomas Wilson in 1816, the old valse à trois temps, and Cellarius' valse à cinq temps of the 1840s. But in all of those cases, the mismatched steps are the basic steps of the dance rather than a variation. That suggests an unusual problem: how does one lead one's partner into different footwork for a variation when one is not doing the same footwork oneself? Pretty easily, it turns out! The American Gavotte is another of the variations published by dancing master M. B. Gilbert in his manual of couple dances, Round Dancing (Portland, Maine, 1890) and republished by G. W. Lopp in La Danse (Paris, 1903). It was attributed by Gilbert to James P. Brooks of Pittsburgh, Pennsylvania (and by Lopp to "J.-D. Brooks"). Gilbert also noted that it was adopted by the American Society of Professors of Dancing, New York -- this would have been in 1886, from contemporary writeups of the event -- and published by permission of White Smith Music Publishing Co. Lopp listed it as "Polka Américaine (American Gavotte)"
The beautiful dance card pictured at right (click to enlarge) went by me on ebay almost two years ago, but the seller kindly uploaded a full set of pictures, inside and out, which I carefully downloaded for future reference. The rest of the images may be found further down this post. The event for which the card was designed was L. G. Marini's 21st Annual Floral May Festival and Ball, held at Marini's Hall, Washington, D.C., on Thursday, May 20, 1880. The card is unused. The dance program, alas, was quite banal, a standard late nineteenth century mix of waltzes (seven), the Lancers (four), a galop, and two polkas. The ball was begun with an aria from Bellini, and the music given for each dance is by well-known composers such as Strauss, Weingarten, Planquette, and Weigand. There were seven dances plus the aria before intermission and seven after. No grand march is mentioned. I'd held off posting this card for so long because I couldn't really think of much to say about it except that the cover illustrations were charming and that it specifically mentioned that refreshments were to be served from 10:00 to midnight, though it neglected to give the actual time of the ball. But there is one minor detail of note: the first polka, to a tune from Faust, is listed as "Polka (Glide)". The other polka is just plain "Polka". Why the difference? There is a polka variation called the Glide Polka which appears in M. B. Gilbert's Round Dancing (Portland, Maine, 1890) and a few other sources including, oddly enough, several physical education manuals going well into the twentieth century. It's very rare for any specific dance variation to be mentioned on a dance card. So while we can't be perfectly certain that the Glide Polka described in Gilbert is what was meant, even the chance that it is documenting the use of that variation makes this card notable. So let's talk about the Glide Polka! One of my ongoing projects is looking at mentions of dance in nineteenth-century books and periodicals in order to get an idea of what people other than dancing masters thought and wrote about dancing. "Kate Crosby's Polka Party" appeared in The Anglo American, a Journal of Literature, News, Politics, the Drama, Fine Arts, Etc.,Vol. 3, No. 26, published in New York on October 19th, 1844, at the height of the first burst of polka's popularity. Let me state first that this story does not describe an actual polka party. This is a fictional morality tale using a hot dance trend as to draw attention. Nonetheless, there is very interesting information within about both the polka's popularity in the fall of 1844 and the practicalities of putting on a small working-class ball, which would have to be realistic enough to be unremarkable to the journal's readers. I recently had the opportunity to watch another teacher do a general introduction to the standard mid-nineteenth century couple dances. That's a rarer event than you'd imagine. Historical dance teachers aren't that thick on the ground, and even at multi-teacher festivals, either there aren't any introductory classes or I'm busy teaching my own classes during them. Watching this class reminded me of something I've been meaning to write up for months about altering how we teach this repertoire. This doesn't apply to the one-night-stand sort of teaching gig, but I think it's something other teachers with ongoing classes may find useful. This post is for Antonia, a superb 19th-century reenactor and dancer who has just completed her freshman year at that Ivy League school up in Boston. Congratulations from a Yalie! I have a strong but unsupported suspicion that the dance variation called the Harvard is some sort of Victorian joke playing off the turn-of-the-century dance known as the Boston. The characteristic step is a long slide forward or backward along the line of dance, similar to the step of the Boston, combined with a sequence of three measures of waltz-galop. The Harvard was described by prominent late 19th-century dancing master M.B. Gilbert in his collection of couple dances, Round Dancing (Portland, Maine, 1890) as a variation for the schottische, though the timing is more that of a polka or galop. It is attributed by Gilbert to the late Professor Vegas of New Orleans. Many people confuse the Polka russe with the Troïka. I will say all the same that, at balls, when the Troïka is announced, almost everyone dances the Polka russe. If the rhythm of the two dances is the same, the manner of executing them differs, in the sense that the one is danced by two people and the other by three...the word Troïka means three, which should prevent all confusion. In the late 1890s and early 1910s a trio of French dancing masters included descriptions of the Troïka, a simple polka sequence for three, in their works on modern social dance. This Parisian Troïka is not the same as the Russian folk dance of the same name, though obviously inspired by it, and the choreographic link with the Polka Russe further emphasizes the connection. I have previously discussed the many variations of the Polka Russe found in late 19th and early 20th century dance manuals, but for those who wish to actually dance the Troïka, I will give a quick summary of that dance. The Polka russe is a dance much appreciated by good dancers; it is of great simplicity while appearing very complicated. I kept tripping over descriptions of the Polka Russe in various sources while researching something else, so I finally decided to pull together all eight descriptions in a little overview. This proved an interesting demonstration of the lack of standardization in nineteenth-century dance: while the sequences given by different authors (or sometimes by the same author) are clearly related, there are enough clear incompatibilities among the various descriptions that there is no way to determine a definitive version. While its origins are unclear, the sources I have range from late 1880s New York to the Paris of the first decade of the 20th century, though the American and French versions differ significantly in dance position and modestly in step-sequence. The Parisian form of the Polka Russe incorporates the earlier "heel and toe" or "Bohemian" polka, which is included in some of the descriptions under the name "polka piquée," while the two versions from New York are very similar to a two-step sequence developed by William Lamb in England in the late 1890s, Tres Chic, and Lamb's similar two-step/schottische hybrid, Tantivy, as well as the popular Washington Post (done to the Sousa tune of the same name), which has similar positioning and arm movements to the Parisian form of the Polka Russe.